Alumnus Leads Mission Parish in "Manifesting the Love of God"
Home > Alumnus Leads Mission Parish in "Manifesting the Love of God"
Fr. Andre offers the homily at St. John the Evangelist (photo: Oca.org)"Sensationalism, headlines, and an obsession with the end of times, with the apocalypse—these are the topics that captivate the heart of man today," says Priest Andre Paez (M.Div. 2013) of St. John the Evangelist Mission  in Tempe, Arizona. "We live in a time of fear, in which people suffer from stress, depression, and anxiety, due to the fear of an unknown future, volatile economic markets, political turmoil, global wars, terrorism, and more. We are faced and surrounded with a seemingly ever increasing darkness. Yet, in the midst of this darkness and shadow of death, there is hope, as Jesus Christ has been victoriously shining forth since the day of His glorious resurrection." It is precisely this hope that Fr. 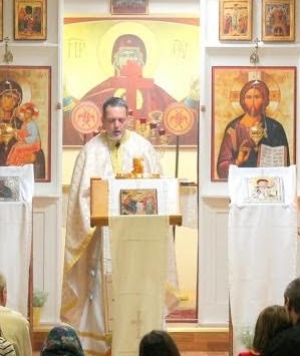 Andre and the faithful of Saint John's, one of the Orthodox Church in America's five fledgling missions currently receiving Planting Grants through the OCA's Department of Evangelization,  are attempting to share. Saint John’s was planted in February 2005 to bring Orthodox Christianity to Tempe, home to one of the largest state universities in the United States. Celebrating its 10th anniversary this year, the community today has grown to embrace some 80 faithful and a steady stream of enquirers from a variety of backgrounds, religious and ethnic. About half of the faithful are converts to the faith. The parish strives to maintain a multi-generational, “kid-friendly,” and welcoming atmosphere that fosters fellowship, while it promotes discipleship by encouraging the faithful to recognize—and use—their spiritual gifts for “the building up of the Body of Christ," says Fr. Andre.